Nine years ago, I starting thinking about changing the layout of my classroom—the traditional classroom structure that had gone largely unchanged since I was a child. I’m now in my eighth year exploring flexible seating with my second and third grade students. I started by asking students to help me come up with design ideas and to brainstorm ways to transform our classroom with the furniture we had at the time. I knew that if that step went well, I could add more furniture in time. Each year I add one new type of seating. I started with ball chairs, and then added tables with wheels and wobble stools. In recent years, I’ve added office chairs and scoop rockers. I’ve won several grants over the last eight years to collect my nontraditional seating options, which now include: 14 tables with wheels, eight wobble stools, six lap desks, six scoop rockers, four ball chairs, four office chairs, and four standing station spots. I still have 10 regular chairs. In the fall, I typically arrange the room the way I want it. My students and I spend time in the first several weeks of school going over rules and expectations. 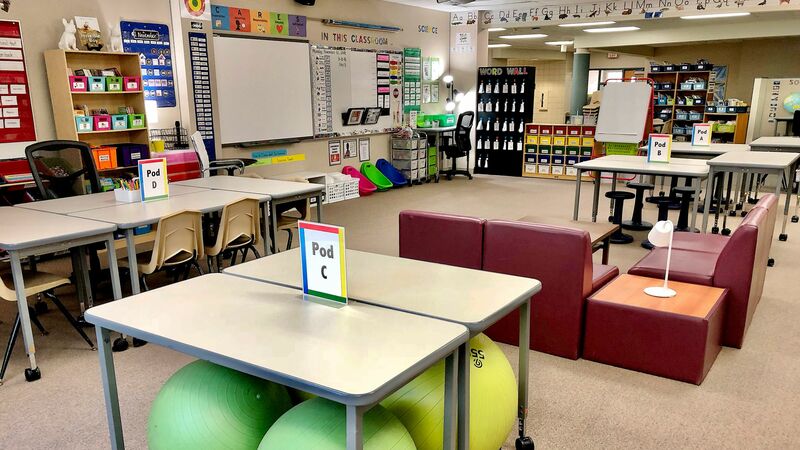 Once our classroom community has the necessary foundation and expectations, I do a lesson on each of the separate seating options and ask all students to explore all of them. After students have explored the room and tried all the seating options, I ask them to help me figure out the room’s layout for the year. Having student input is extremely important to me, and I often tell my students it’s our classroom, not just mine. I want them to want to come to school and learn in a space that reflects them. I then have the students help me create rules for flexible seating, and we hang up posters for each option that my students can refer to throughout the year when needed. For example, with the ball chairs, students are asked to have their feet on the floor at all times and to avoid excessive bouncing. If students aren’t following the rules, we review them so everyone is clear about what’s expected. I’d encourage any teacher interested in experimenting with flexible seating to go slow, pick one thing to add to your classroom, and continue to add items slowly. I strongly suggest buying quality over quantity. I typically only purchase items that are plastic and can be wiped down, and I avoid fabric—with the exception of my office chairs—because it’s hard to keep clean. One thing teachers need to keep in mind in shifting to flexible seating is how they’re going to use storage. Each of my students has a work bin—a plastic tray that fits into our standard mailbox slots—where they store their notebooks and folders. Each student also has a Tupperware supply bin with markers, crayons, and colored pencils. The work and supply bins have set locations so students know where their things are, no matter where they choose to sit. Every type of seating option has pros and cons. Teachers have to think through how they’re going to manage, store, and use each and every piece of flexible seating, which is why I encourage teachers to not buy a full set of anything at first—I still don’t have a full set of any type of seating. Kids are different, and they like different things. Having different types of seating gives students options. Each month, students help me select their new work spots. In addition to the work spots, students have a row spot (for whole group instruction), circle spot (for morning meeting), math spot, reading spot, pod spot (for collaborative times like science experiments), and a test spot (where all students have a flat surface for testing). We tend to use the work spots the most. Students are unique—and so are groups of students. Some years, my students have needed a lot of structure and little to no freedom. Other years, my students have been able to have total freedom. For flexible seating to work, teachers have to know their students and what they can and can’t handle. So at the beginning of the year, I take time to get to know my students, and I have more of a say in where they sit. As they come to understand the different seating options, I give them more freedom. On occasion, students don’t work well with one type of seating, and I give them limited access to that type. Strong classroom management is key to this model. Each year, I also focus on something new to make my classroom more student-centered. Some years I’ve focused on technology integration or collaborative spaces. This year, I’ve worked to create more spaces for those students who prefer to work alone when given the opportunity. I often ask myself if I would want to be a student in my own classroom. After eight years of trial and error, I feel like I can say yes. I truly enjoy my classroom—it’s a unique, comfortable, student-friendly place to learn. But I’m still excited about brainstorming with my students on how to make it even better next year.